Taking more of a non-traditional approach to writing and producing their own songs, the New York two piece I Am the World Trade Center (named prior to 9/11) records all their samples and loops on laptop computer. On top of Amy Dykes' melodic vocals, the band gives props to St. Etienne, the Stone Roses, Fatboy Slim and Cornershop as major inspirations to their sound, all of which can be heard on their recording debut (the Christmas Two compilation, courtesy of Kindercore Records). 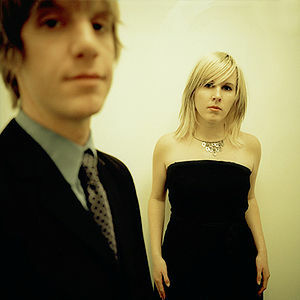 Out of the Loop, the duo's proper debut album, was issued in summer 2001 and their follow-up Tight Connection appeared in 2002. Two years later, the band recorded The Cover Up, but while touring the East Coast in support of the album and three weeks shy of its release date, Dykes fell ill with Hodgkin's lymphoma. I Am the World Trade Center immediately went on hiatus so Dykes could make a proper recovery. Last night (Apr. 19) in Athens, GA, Kindercore Records duo I AM THE WORLD TRADE CENTER covered Morrissey's "Suedehead" at the Forty Watt club. Needless to say, the crowd went wild. ↑ Mike DaRonco. Biography: I Am The World Trade Center. AllMusic.com. Retrieved from AllMusic.com. This page was last modified on 15 April 2013, at 23:30.